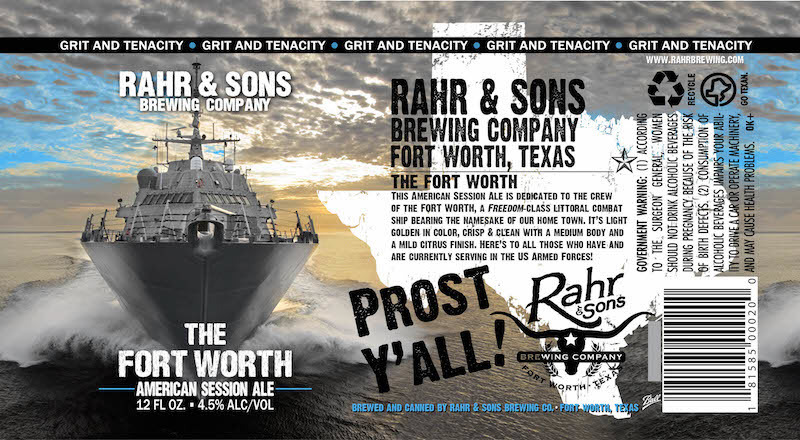 In the latest example of its commitment to philanthropy, Rahr & Sons Brewing Co. will present a check for $5594 to the USS Forth Worth Support Committee next month. The money was raised through the sale of the brewery's American-style session ale, The Fort Worth. A portion of all sales of The Fort Worth are donated annually to the Committee, which provides moral support to the crew and families of the USS Fort Worth. 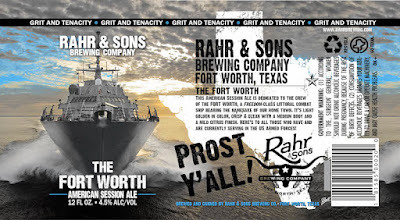 Officers from the USS Fort Worth will be on hand for the presentation of the check, which will occur during Rahr & Sons regular tasting event on Saturday, June 17 from 1-3 p.m. Admission to the event will be $10pp, with attendees receiving a commemorative pint glass and three beer samples. In related news, Rahr & Sons has also reached its initial $10,000 fundraising goal related to efforts benefitting the work of charity: water. Combining these numbers with money raised through other initiatives, the brewery has now raised more than $160,000 for numerous nonprofit organizations since 2004. "Supporting our community is a key aspect of Rahr & Sons' mission statement," says co-owner Erin Rahr. "We feel fortunate that our business growth has allowed our definition of community to expand with it, so we are able to have a positive impact on people around the world." Labels: charity, events, Fort Worth, Rahr & Sons Brewing Co.